Capacity 256GB. Data retention Over 10 years. Interface USB 1.1/2.0 Compatible. Reading Speed(USB2.0) 8-20mb/s based on different capacity. Storage Temperature -20°C~ 55°C. Storage Relative Humidity 20% ~ 93%(40°C). Capacity: 256 GB. Interface: USB 2.0. Key chain design and easy to carry. Hot plug & play. Support Windows 7 / 8, Windows Vista, Windows 2000,Mac OS X, Linux. PNYs Turbo Attache 3 is Built for Speed & Convenience Get the most out of the USB 3.0 port on your new computer. Experience USB 3.0 next generation speed performance with transfer speeds up to 10X faster than standard PNY USB 2.0 Flash Drives. USA SELLER-100% Genuine SanDisk Retail Pk-Ships Fast !! USA Seller. Best Price And Service. Amazing Deal!!! Feature: 1. USB connection,support Hot plug & Play. Interface type: USB 3.0 P roduct. 1 U SB Flash dri ves. Fast speed in write/read transfer. Solid State Storage, Shock proof and electromagnetic proof. 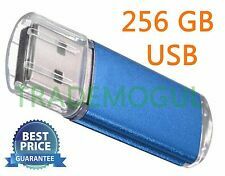 SanDisk 256GB EXTREME PRO USB 3.1 Solid State Flash Drive NEW, Sealed. 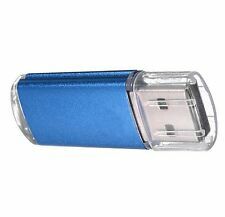 When it comes to storing files, a 256 USB flash drive offers enough storage for almost any project. Lightweight, small, portable, and inexpensive, the 256GB USB flash drive is an easy option for data in the office, at school, or at home. You can find these affordable flash drives on eBay. How much data does a 256GB flash drive hold? A 256GB flash drive works well for storing music, photos, and videos, but it is also powerful enough to run a program or even an operating system. The number of songs or photos stored on 256GB depend on the length of the song, the quality of the picture, or the quality of the MP3. 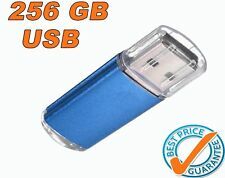 A 256GB flash drive holds around 33,000 8MB MP3s or around 87,000 3MB photos. What features should shoppers look for?If you are shopping for a 256GB USB flash drive on eBay, consider these three features: case, capacity, and transfer rate. A sturdy, small case will fit almost any device without blocking access to other ports, it is easy to carry, and it holds up well. The capacity needed depends on how the drive will be used and the amount budgeted for the purchase. The transfer determines the rate the data can be moved to and from the flash. A 2.0 interface usually has more bandwidth than a flash drive needs. The read speed is faster than the write speed, making the read speed a limiting factor if not powerful enough. Read speeds go up to 34 Mbyte/s.What's the difference between Mbps and MBs on storage devices? Mbps or Mb/s stands for “megabits per second” and refers to the speed that data can be transferred from a PC to a storage device. That can range from 30 to 50 to hundreds of Mbps per second. A megabyte, often confused for megabit, is eight times larger than a megabyte, making one megabyte per second (MBs) eight times faster than one megabit per second. What are some advantages of flash drives?